When Ceenet Systems fell, JackER rose. 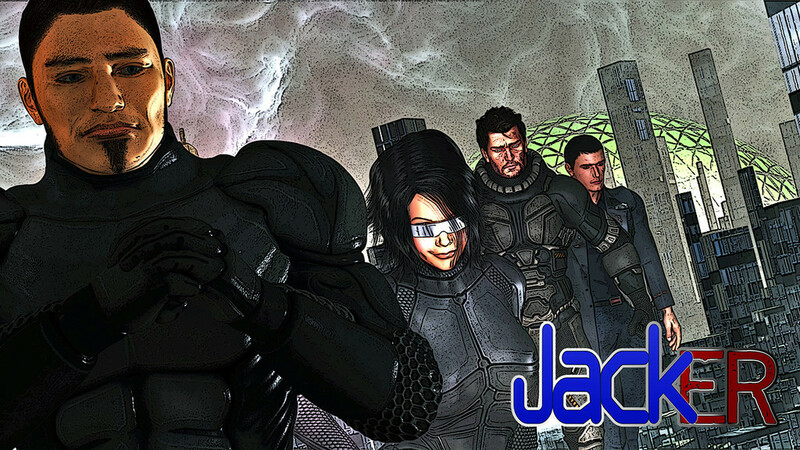 Meet Jack, a guy who's life turned upside down when the Ceenet building came crumbling to the ground (see Human: Playing God). He vowed to take revenge against the man that destroyed his life. Jack became a robotics hacker, turning machines against their creators. Down this dark path he'll not only lose himself, but the bonds he's forged 8 years after the fall. The idea I have in mind for the story is mostly set in that 8 year gap, from the destruction of the Ceenet building in Human: Playing God, leading right into the Desert Earth storyline, and beyond. It will introduce and reintroduce characters pivotal to the followup movie, Rising Sands, which will take place on Mars. If you watch Human: Playing God closely, there are hints within the story (mainly a news bulletin) that talks about Rigile Santos, the first Martian city, and its occupation by the Syndicate. The occupation of Mars is a major plot point in Rising Sands.